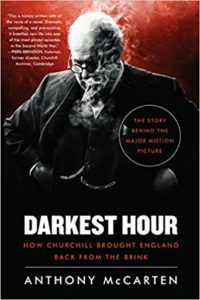 Mr. McCarten wrote the screenplay for the excellent Churchill film Darkest Hour, starring Gary Oldman. He also writes novels. In some parts this book reads like one. 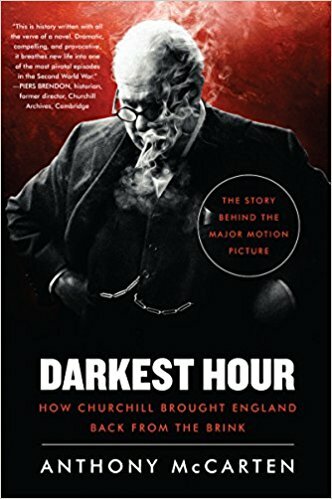 The bad news is that this work will not, as one blurb claims, stand “alongside any of the great studies of Churchill.” The good news is that its faults are not reflected in the movie. Churchill said (and Gary Oldman has just reminded us), “Nothing surpasses 1940.” As France was falling in May and June, his moral strength overcame colleagues’ impulse to seek terms with Germany. The story is not new. It was told first by Churchill in Their Finest Hour (1949). Martin Gilbert gave a forensic examination in Volume VI of the official biography (1983). The challenge by the “peace lobby” was detailed by Andrew Roberts in his biography of Lord Halifax, The Holy Fox (1997). John Lukacs in Five Days in London: May 1940 devoted an entire book to it (2001). In Cabinet’s Finest Hour (2017), the parliamentarian David Owen cited the tale as a triumph of the cabinet system. What’s new? It is the claim—contrary to virtually every historian—that Churchill seriously considered peace with Hitler. Not only, we are told, did Churchill ponder giving Hitler “overlordship of central Europe.” He even contemplated giving up Malta and Gibraltar. And with France defeated, he had serious doubts about fighting on. The trouble with this is explained by abundant literature. It is true that Churchill had doubts about the outcome. His bodyguard Walter Thompson testified to this: “God alone knows how great it is,” he told Thompson after becoming prime minister. “I hope that it is not too late. I am very much afraid that it is.” But Churchill wore no blinders about Hitler’s Germany. And he never seriously considered an armistice. …the public image of a pugnacious battler who never doubted himself does not do [Churchill] justice; it makes him unreal, a cliché, less a three-dimensional human being than the product of a collective dream. Rather than diminish him, his indecision, his ability to put on a strong face in order to keep morale up while thinking of different solutions, recommends him. To many readers it may sound reasonable. We are told that Churchill, a good human being, was only being human. Why shouldn’t an ordinary man consider the alternatives to going down fighting? Why indeed? But Churchill was not an ordinary man. The Dunkirk evacuation was at its height. Churchill needed to see how much of the Army was coming back. Only then he could work out what the rest of the war looked like. To gain time, he implied to the Halifax-Chamberlain faction that he was being reasonable. But he insisted that Britain could not be seen to enquire about peace terms. He blocked Halifax finding out. When Halifax enquired anyway, Churchill went around the War Cabinet with an emotional appeal to the wider Cabinet. whether it was part of my duty to consider entering into negotiations with That Man. But it was idle to think that, if we tried to make peace now, we should bet getter terms…. The Germans would demand our fleet—that would be called “disarmament”—and our naval bases, and much else. We should become a slave state…. I am convinced that every one of you would rise up and tear me down from my place if I were for one moment to contemplate parley or surrender…. If this long island story of ours is to end at last, let it end only when each one of us lies choking in his own blood upon the ground. What followed was extraordinary. His colleagues, all experienced politicians, rose as a body. They ran to his chair, shouting and patting him on the back. “There is no doubt,” he wrote “that had I at this juncture faltered at all in the leading of the nation I should have been hurled out of office.” Every one of them, he thought, “was ready to be killed quite soon.” Every one was ready to lose family, possessions, life itself—rather than surrender. The debate was over. 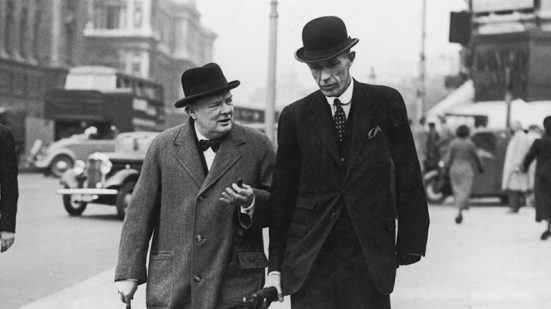 Churchill permitted a secret Anglo-Italian meeting to take place in London between Halifax and Ambassador Bastianini on 25 May, provided it was not made public—a meeting that made explicit the matter of a peace deal with Hitler, with Mussolini acting as the intermediary. Subsequent to this meeting, Churchill granted Halifax formal permission to draft a memorandum to the Italian Ambassador to discuss further the terms of a peace deal that might involve both Britain and France. This is a misconception. What Churchill authorized Halifax to discuss with Bastianini was not peace negotiations—but under what conditions Mussolini would not declare war on Britain and France. Halifax exceeded his brief by discussing possible peace terms. Churchill had not authorized this. But once Halifax raised the issue, such was his standing that the PM had to listen. These facts are in The Holy Fox, Andrew Roberts’s Halifax biography, pages 212-15. Since McCarten quotes Roberts liberally, it is odd that he missed this key distinction. Aside from the author’s insistence that everybody else is wrong—that Churchill seriously considered an armistice with Hitler—this is an entertaining book. The potted biography in Chapter 2 should be ignored, because it is laced with errors. (Lord and Lady Randolph meet in 1893. Lord Randolph dies of syphilis—again. Young Winston attends schools “around the country.”) Still, most of the account is excellent. It’s well trodden ground—how could May 1940 not be? It does capture the hubris and ethos of those dark days. He simply comes up with a questionable thesis.